Fire and rescue services continue to be on the scene in Pannal this morning to divert floodwater from properties. A North Yorkshire Fire and Rescue Service spokesperson said: "Crews from Harrogate are currently dealing with flooding in the Pannal area due to a blocked culvert. Crews are diverting water away from properties awaiting arrival of Harrogate Borough Council to assist." Pannal resident Christina Wilby said the flooding has been so bad that the entrance to St Robert's Church is blocked off. She said: "There is a constant worry for Pannal residents about flooding, especially around the church area and along Crimple Beck. I hope the residents facing onto the church and the church itself get it resolved as quickly as possible, especially with the amounts of rain and snow we have been having lately. 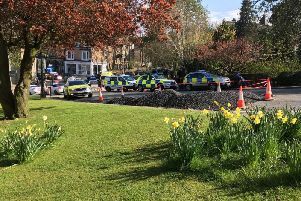 "The fire brigade are currently pumping water from one side of the tunnel to the other to try ease the flow, and a blockade has been put in place to try divert the water from the houses on Pannal Green." Residents have been grabbing sandbags to try and reduce the impact of the flooding, as water creeps closer to properties. The scene in Pannal this morning.Picture: Nadine Witcher. Watch our Facebook Live video from Pannal this morning, where we speak to Steve Scarre about what it's like down there at the moment. Gareth Humpage, who lives just behind St Robert's Church, said: "Neighbours have been bringing stuff out of their garages to build flood defences. "The fire brigade is out trying to stop water coming into people's gardens. "The real issue in Pannal is we've got plans for more homes to be built, which will only produce more surface runoff." David Crane said: "Residents have built a blockade to divert the main flow away from their houses into a smaller beck running down the back side of the church." The Pannal community has been really pulling together to battle against the flooding. Watch our Facebook Live video where we speak to St Robert's Church vicar, the Rev John Smith, and church warden Ann Howard about the action that's been taken by residents today.